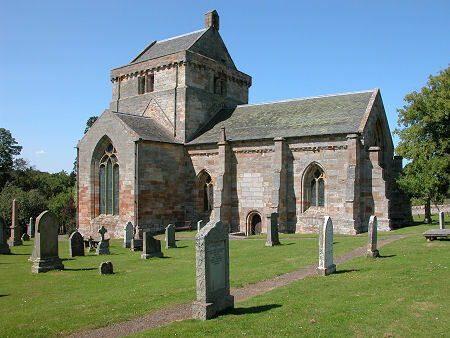 Crichton Collegiate Church lies, quite literally, at the end of the road. A few hundred yards of single track road separate it from the tiny settlement of Crichton, while to its south only a track continues the further few hundred yards along the valley to the remains of the reason for the church's existence, Crichton Castle. 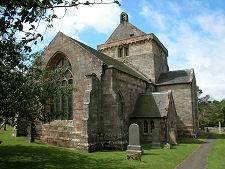 Collegiate churches became an increasingly common feature of lowland Scotland in the 1400s. Powerful landed families of the day had a number of ways of showing their status. Improving their familial home, more often than not a castle built over the previous couple of centuries, was one popular way of reflecting success. But another was to build a church to house a college of priests, hence the term "collegiate church". Their role in life was to pray each day for the souls of the Lord who built the church, and his family: thereby, it was hoped, easing their path to salvation. Crichton Castle had been built in about 1400 but was attacked and damaged by the Douglas family in the early 1440s. William, Lord Crichton, the Chancellor of Scotland, effected repairs in the late 1440s. While he was at it he vastly expanded the castle and he also built Crichton Collegiate Church a few hundred yards to the north. 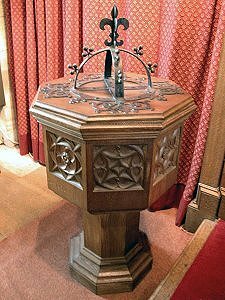 The church was finished in time to hold its first service on 26 December 1449. Today the church comprises north and south transepts either side of the tower, while to the east is the choir originally used by the priests and family for prayer and worship. To the north side of the choir is a sacristy. The college of priests at Crichton comprised a provost, eight priests, two choirboys and a sexton. Building lines and ragged stonework on the west side of the tower reveal that as originally built there was also a nave extending to the west of the surviving building. This was provided for the use of the local population, but would have been built to a lower specification than the more "important" parts of the church. 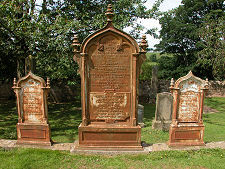 As a result, in common with the nave of Seton Collegiate Church, it has not survived. 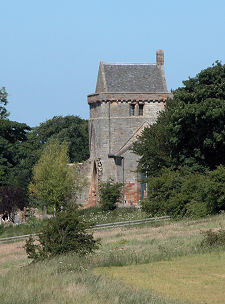 The Crichtons fell out of favour with James III in the 1480s and their lands and titles, including Crichton Castle and Church, were bestowed on the Earls of Bothwell. 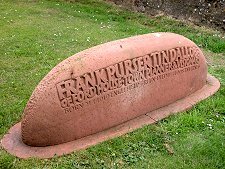 The Reformation of 1560 swept away the system of Collegiate Churches in Scotland. 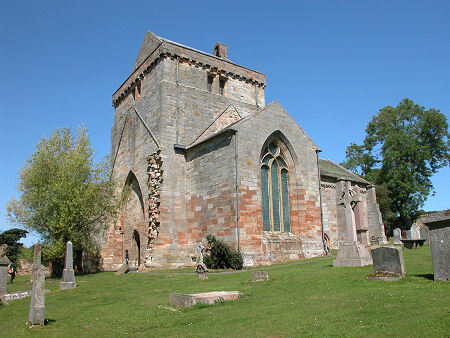 Crichton Collegiate Church suffered doubly through being part of the estates seized from James, 4th Earl of Bothwell in 1567 after the abdication of his wife, Mary Queen of Scots. By the time a new owner embarked on a major programme of rebuilding of Crichton Castle in the 1580s, Crichton Collegiate Church was already in a state of disrepair, and over the following centuries it became little more than a ruin. 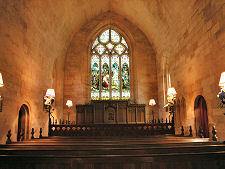 In 1825 the church, by now without its original nave, was brought back to life to serve the wider community. A pulpit was placed high on the south wall, and with the extensive use of galleries around three sides of the interior as many as 600 people could be seated in what must have been a very cramped space when full. In 1898 the galleries were removed and the church emerged much as you see it today. Further restoration work took place in the late 1990s to coincide with the church's 450th anniversary. 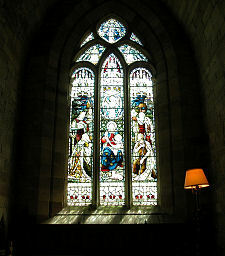 The stained glass windows were restored in 2002, and in 2010 an appeal was launched to restore the church organ. The focus of today's church lies at its west end. 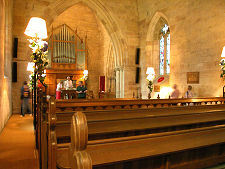 All the pews in the choir face westwards, while those in the transepts face towards the tower. 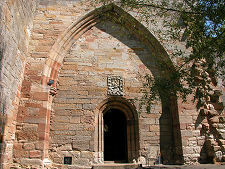 Crichton Collegiate Church is open to visitors as set out on the right, though the exterior can be viewed at any reasonable time. Coupled with a stroll to Crichton Castle a visit to Crichton Church makes an excellent Sunday afternoon outing.